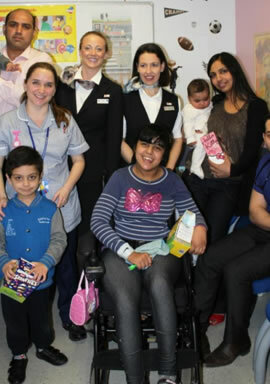 The Easter bunny came early for children at West Middlesex Hospital. A colourful variety of chocolate eggs were donated and handed out on Starlight and Sunshine wards, and the A&E paediatric department, by cabin crew from Japan Airlines (JAL). Ground and flight staff from JAL’s nearby Heathrow base donate eggs each year to treat children needing to come to West Mid over Easter. Crew members Deena Green and Almudena Barcon Fernandez accompanied nurses, and chatted to children and parents while handing out the treats. Local stores also gave generous donations of chocolate eggs for children in the A&E paediatric department thanks to staff nurse Beverley Haffenden who organised the donations. The hospital says their generosity has lifted the spirits of the staff and children for the Bank Holiday weekend.